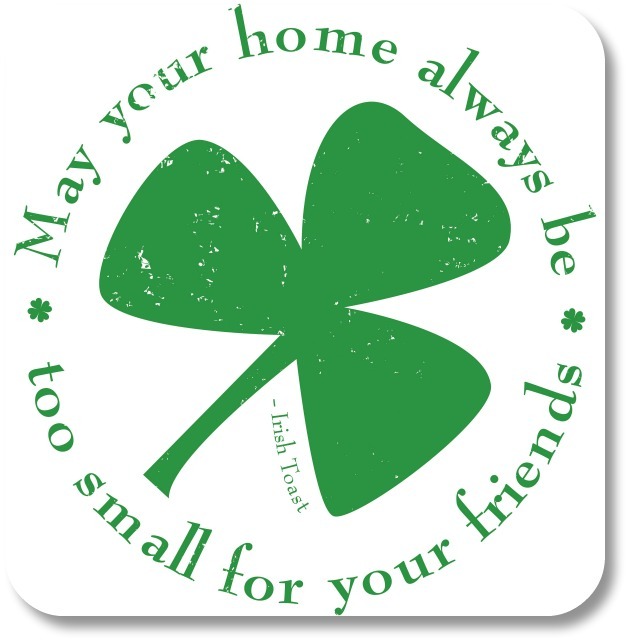 Irish Symbols: 10 Beautiful Ways to Express Your Personal Irish Side! 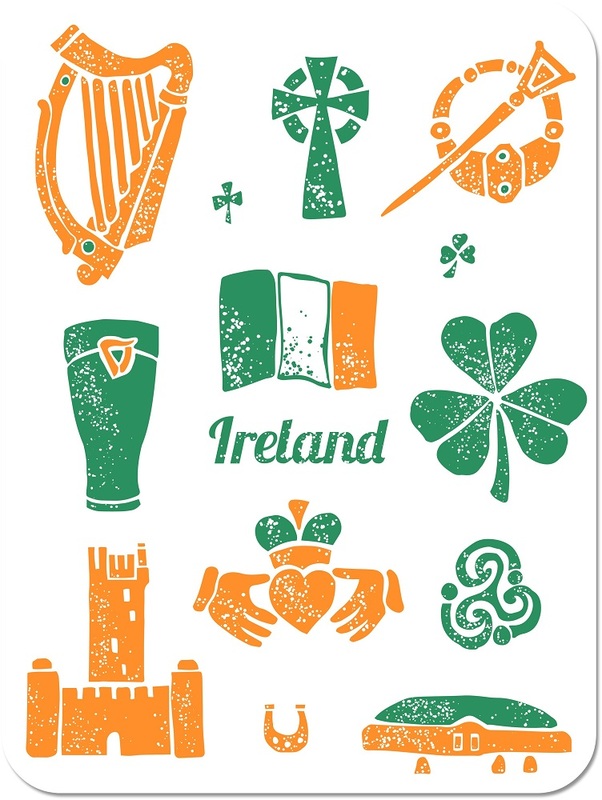 Irish Symbols: Add these Beautiful Designs to Your Personal Irish Expressions! You don’t have to look far to see Irish symbols. They appear all around us, on clothing, jewelry, artwork, tableware and more. In fact, they are so popular that it is very common to see them proudly displayed by people with no Irish heritage at all! And that's just fine with us - in our humble opinion, everybody has an Irish side! The fun behind these symbols is using them to express your Irish side, sharing what they mean and why they are important to you. Shall we take a closer look at some of them? Irish Symbols: Find Out How Much You Already Know! So - How Did You Do? A score of 80 or higher is a sign of a well-developed Irish side! A score of 60-70 is pretty good! You are probably the life of the party on St Patricks Day! A score of 0-50 means you should brush up on your knowledge of the Emerald Isle! Keep exploring Irish-expressions.com to discover exciting images and facts, and to learn about the many ways to express your Irish side, wherever you happen to be. 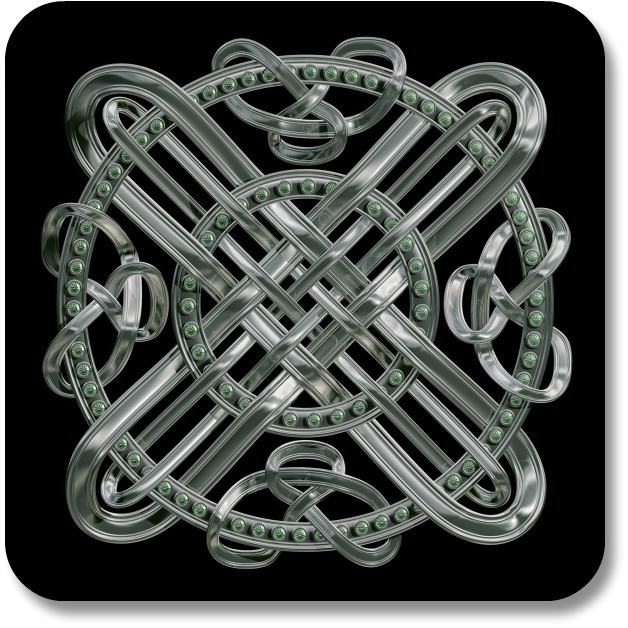 Sometimes called "Irish knots" or "Mystic knots," Celtic knots are patterns of lines with no visible beginning and no apparent ending. Aside from being lovely, they are said to have important meanings, which you can learn more about in on this site! As with many symbols of Ireland they appear on everything from clothing to tableware to jewelry to body art. For information on this beautiful Irish symbol, visit our page on the Celtic Knot. This classic symbol of Ireland is shaped like a traditional Christian crucifix, with the addition of a circle around the intersection, symbolizing eternity. It is typically decorated with symbols or scenes of various biblical events, and it is found in a variety of Irish expressions today, including art, tattoos and jewelry. Visit our section on the Irish Cross for much more information about this important symbol of Ireland. 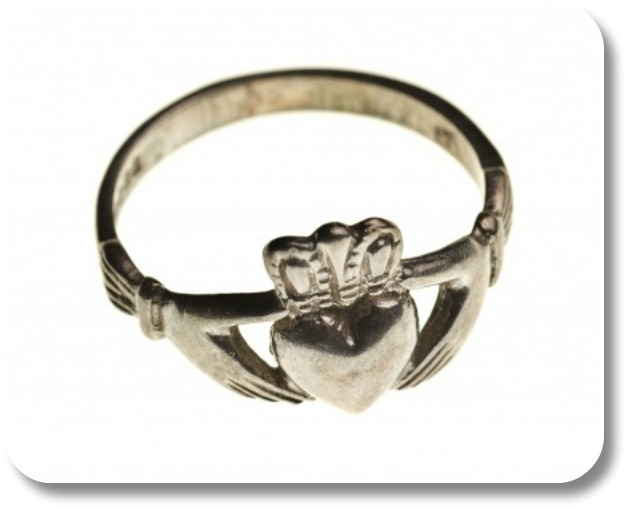 This classic symbol originated in the town of Claddagh, and was first made into the famous claddagh ring in the 17th century during the reign of Mary II. Two hands represent friendship and the crown stands for lasting fidelity and loyalty, while the heart represents eternal love. Much more information on this key Irish symbol can be found in our page on the Claddagh Ring Story here. 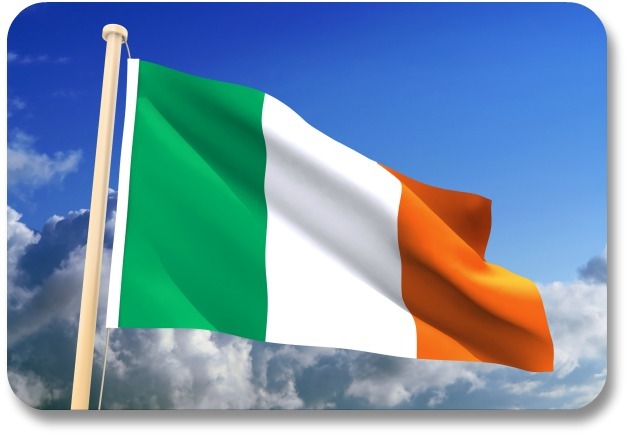 The Tricolour flag is the national flag of Ireland. This flag was first introduced back in 1848 by Thomas F. Meager. It was officially adopted in 1921. The green represents the Catholics and the orange stands for the Protestants in Northern Ireland. The white represents the hope of peace between them. Learn much more in our section on the Irish Flag. Back in the 12th century, long shields and chain-link mail were replaced with helmets that covered the whole head, full-body armor and smaller shields. Knights could not be individually recognized. They began marking their shields with emblems to identify themselves for the tournaments or battles, and the family crest was born! Learn more about these remarkable symbols of Ireland in our page on the Irish coat of arms. The Celtic Harp needs no introduction. This famous symbol can be seen everywhere from Irish clothing to Irish coins to beer bottles. The Harp has a storied place in Irish history, and is a one of the most important elements in traditional Irish music. 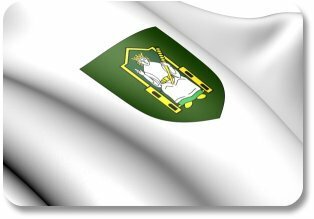 It appears on flags and family crests, plays a part in Irish stories and folklore - and it just happens one was being played on in the courtyard in our last sight-seeing visit to Blarney Castle! 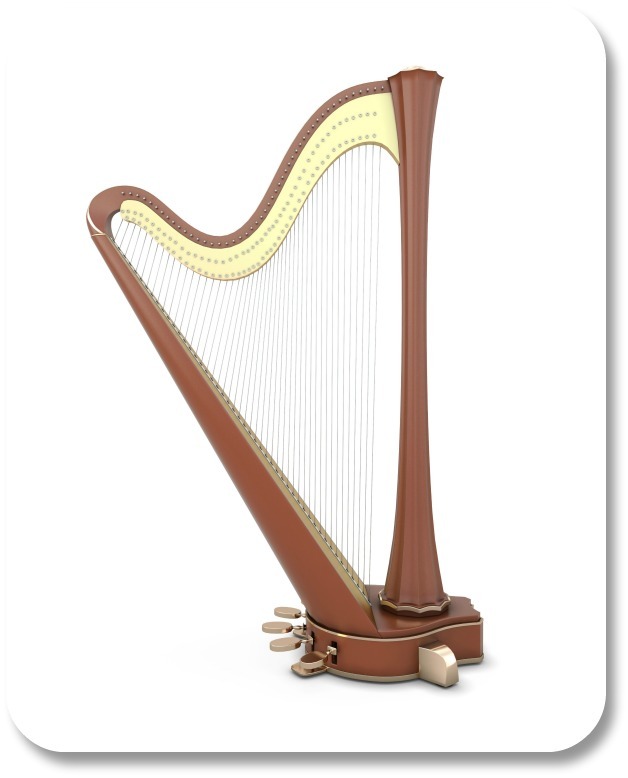 Find much more information in our section on the Irish Harp here! The Tree of Life represents a number of Irish values with Celtic roots. Among these are strength, longevity and connection with the earth. 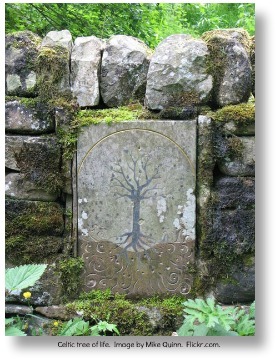 As with many Irish symbols the Celtic Tree of Life appears in many legends and myths. It also adorns Irish jewerly, clothing, and other Irish works of art. Find much more information in our section on the Tree of Life here! A close cousin of the Celtic knot, the Trinity symbol (or triquetra) symbolizes strength, eternity and the power of three, among other things. As with many other important Irish symbols, this one has found its way into jewelry, clothing and works of art. The roots of the Trinity symbol go back literally thousands of years. 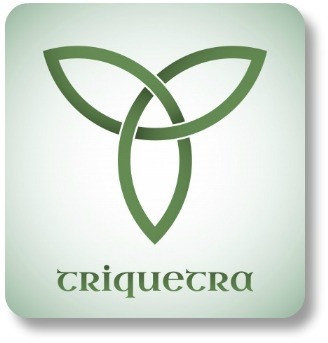 For much more information about this important symbol of Celtic Ireland, please enjoy our page on the Trinity Symbol here! Finally, the world-famous Irish Shamrock. Rumored to have the power to ward off evil spirits, scare away snakes and heal diseases, this little symbol packs a mighty punch. So much so that at one time it was banned from public display by the Queen of England. If that simple little description leaves you wanting more, please check out our section on the Shamrock symbol here! We hope you have enjoyed this overview of symbols from Ireland, with a bit of information on their Celtic origins. You will find even more information and examples in our section on Celtic Symbols. As you continue to explore this site, you will bump into Irish symbols everywhere! Enjoy the journey! If you have enjoyed our section on Irish Symbols, you have probably been exposed to many of the loveliest songs that Ireland has to offer! But even if that is not possible, you can still enjoy the magic of Ireland in these pages. 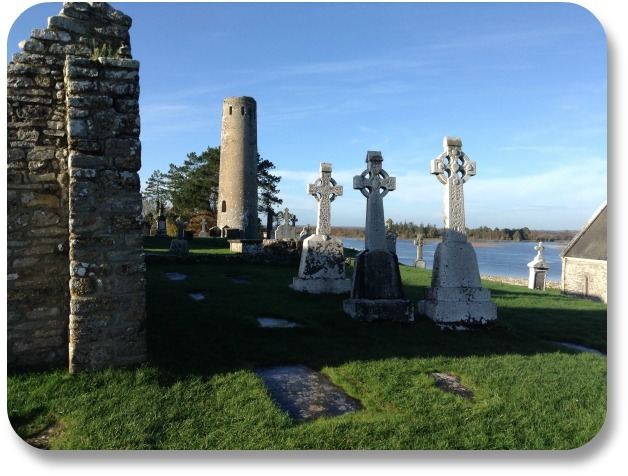 Check out the links at the top of the page for simple instructions on how to explore Irish landmarks, enjoy Irish food, listen to Irish music, and much more! Until then - thanks for visiting! Please continue exploring your Irish side at Irish-Expressions.com.